When emission-related ECU detects a malfunction in the emission control systems components and/or the powertrain control components (which affect vehicle emissions), it turns on/blinks MIL to inform the driver that a malfunction has been detected. The MIL illuminates when ignition switch is turned ON (engine is not running). Check the MIL circuit if MIL does not illuminate. Refer to EC- 467, "Component Function Check". When the engine is started, the MIL should go off. 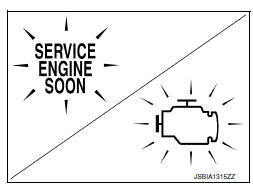 If MIL continues to illuminate/blink, perform self-diagnoses and inspect/repair accordingly because an emission-related ECU has detected a malfunction in the emission control systems components and/or the powertrain control components (which affect vehicle emissions).